Bias tapes are often used to nicely and evenly take off garments. For example, the edge of a neck opening, sleeves or the bottom of a skirt. By using a bias tapes you lose less fabric and it gives you the opportunity to give a creative twist to your creation. In our assortment you will find biais tapes of 15mm and 20mm, in stretchable variants, printed with stars or in animal prints. Bias Tape Stretch 15mm - Giraffe.. Bias Tape Stretch 15mm - Leopard.. Bias Tape Stretch 15mm - Panther Multicolor.. Bias Tape Stretch 15mm - Tiger.. Bias Tape Stretch 15mm - Tiger Brown.. Bias Tape Stretch 15mm - Zebra..
Ribbon Star 15mm - Cobalt..
Ribbon Star 15mm - Eggplant..
Ribbon Star 15mm - Ochre..
Ribbon Star 15mm - Orange..
Ribbon Star 15mm - Petrol..
Ribbon Star 15mm - Pink.. 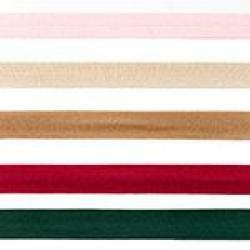 Bias tape 20mm Cotton Tricot - Choco.. Bias tape 20mm Cotton Tricot - Dark Blue.. Bias tape 20mm Cotton Tricot - Dark Grey Melange.. Bias tape 20mm Cotton Tricot - Purple.. Bias tape 20mm Cotton Tricot - Bottle Green.. Bias tape 20mm Cotton Tricot - Bordeaux.. Bias tape 20mm Cotton Tricot - Warm Red.. Bias tape 20mm Cotton Tricot - Petrol..